I’ve been working on a scene in my book that is a pivotal moment for my main character. I’m not actually that far along in the story yet, but I really wanted to write it so I skipped ahead. The difficulty in writing the scene was the need for Rosaline to decide if she trusts someone or not, and I needed to decide if her decision is the correct one. My choice and hers could bring the story in different directions and I had to weigh the pros and cons of each. An added concern was that the choices revolved around a real life event, so the characters’ actions had to make sense for the real outcome. On June 14, 1497, after leaving a family dinner at his mother’s home, Juan Borgia was murdered and his body dumped in the Tiber in Rome. The Pope began an investigation, but abruptly called it off after only a few days. 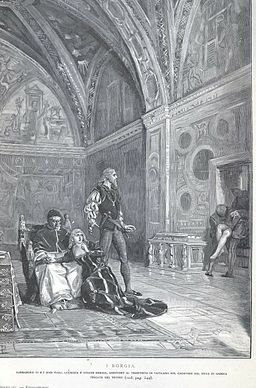 As a result, while the family had many enemies, a rumour implicating his brother Cesare began to circulate. Juan’s murder was never solved. At this point in my story, Rosaline is close to the Borgia family, acting as Lucrezia’s confidante and friend and frequently sparing with Cesare, though they are also friends. It is a dangerous time and Rosaline needs to decide what path she wishes to follow. While the process was difficult and I struggled to make a final choice for the plot, I really enjoyed writing it and, ultimately, I think I stayed true to Rosaline’s character and her development. Now I have to go back and tie the sections of my story together. Knowing where the characters are going and what the fall out will be helps me weave details and clues in the previous pages. I have to admit, the hard work of putting together feels really satisfying.